Any plastic found washed to shore (or still floating on water) can be used to create this mural. This project began in September of 2011. The process started by using water-based colored pens to sketch a picture of an island with two palm trees and a turtle, surrounded by ocean waves and the sun. Found plastic was collected and gently cleaned by soaking in water with a bit of bleach. All pieces were glued to the foam board backing with clear silicone caulk, using the colored areas as a guide to create the final scene. All of the color you see on the mural now is from the plastic found on waterways. This mural is best seen first from 15 to 20 feet away, and then close up to see the detailed pieces of plastic that were found. Overall dimensions of the mural are 40" by 60" and it weighs approximately 4 pounds, unframed. The young adults involved in this project were participants of the WATCH program, hosted by the Monterey Bay Aquarium in California and students of the Pajaro Valley Unified School District. They helped find certain colors of plastic during their own research of Elkhorn Slough water conditions. Adults who helped with this project include staff from a company where DuCharme used to work, family members, and friends. The mural was housed during construction for many weeks outside of DuCharme's office at work, and for many more months on the dining room table at home! Special thanks to Bill Bennett, who tolerated many hours of having DuCharme hunt for trash while vacationing in Costa Rica, and Julia Beal - who didn't think it odd at all to keep eyes to the ground looking for non-recycled bottle caps, instead of watching the ocean waves crash at Pacifica beach. Thanks to each and every person who helped with the project and to those who gave lots of encouragement along the way. 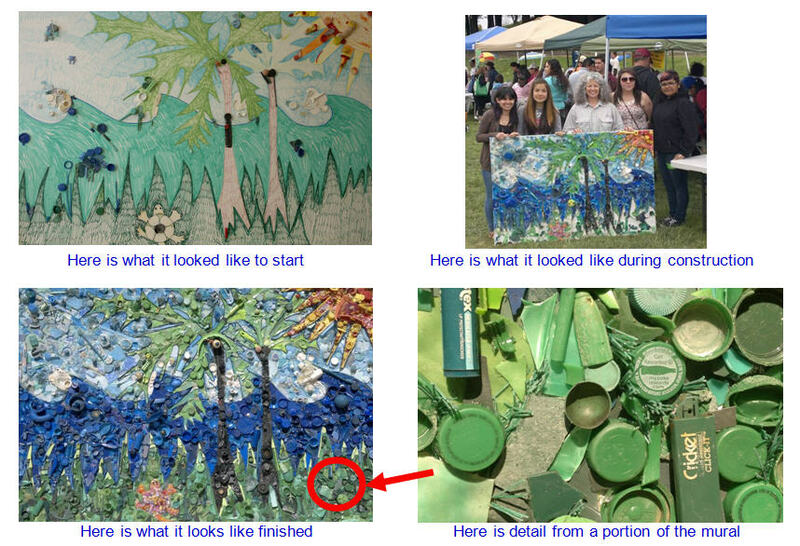 The mural was still in production while it was shown at the 2012 Watsonville, California Earth Day Fair. The completed mural was also shown at the 2012 Burlingame Green Fair. If you wish to see this mural in person, you will need to visit the Shoreway Environmental Educational Center in San Carlos, California which is a really cool place to visit anyway - you should see those HUGE sorting machines. Now I understand why we can throw everything together in one bin for recycling - those machines sort it all for us. Go check it out.